New build apartments and townhouses in Bristol. 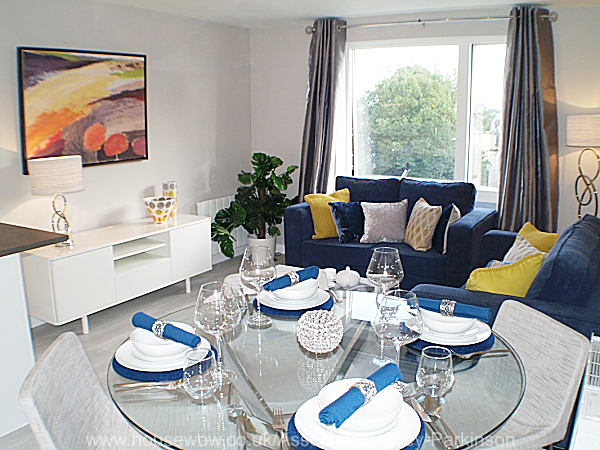 Dressing a living room show home in blue, white and gold. This dual aspect sitting room needed to show dining as well as sitting space. A round table was chosen to maximise the space, along with a glass coffee table. Different blues with a touch of gold added colour to the grey walls and flooring. 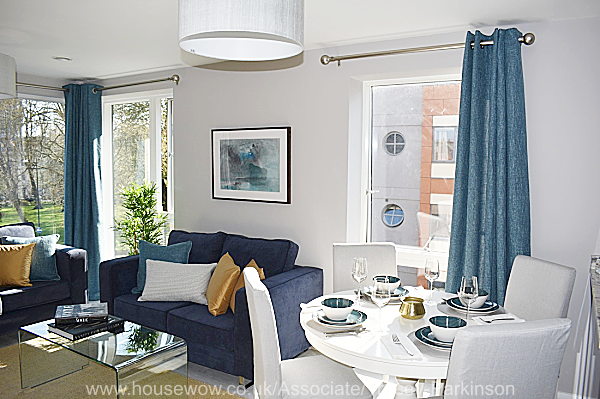 Dressing a dining and living room open plan show home in blue, white and gold. A circular glass dining table added to the feeling of space in this sitting room with contemporary furniture and lighting aiding the sale of this new build flat whose target market was young professionals. Dressing an open plan kitchen dining area in blue and white. 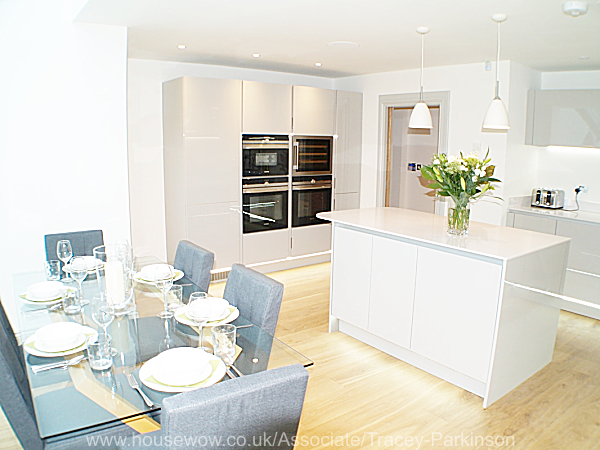 Rental furniture was used to dress this new build luxury townhouse in Bristol. 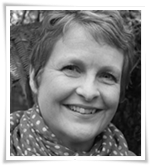 Viewers had been unable to envisage how they would use the space, but it sold shortly after staging. 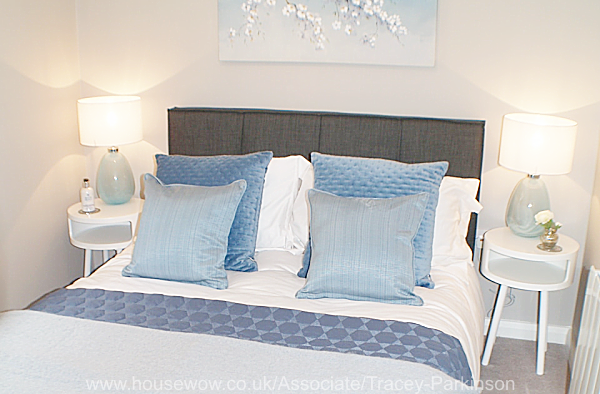 Dressing a show home in blue, silver and white - bedroom 1. 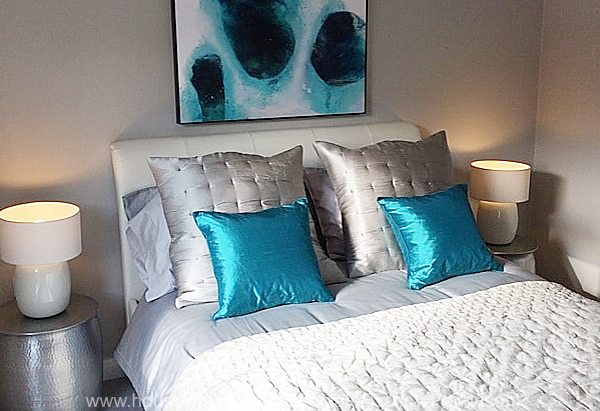 Muted blues and greens were used in this compact bedroom to give a feeling of calm and space. The buyers also bought the furniture. 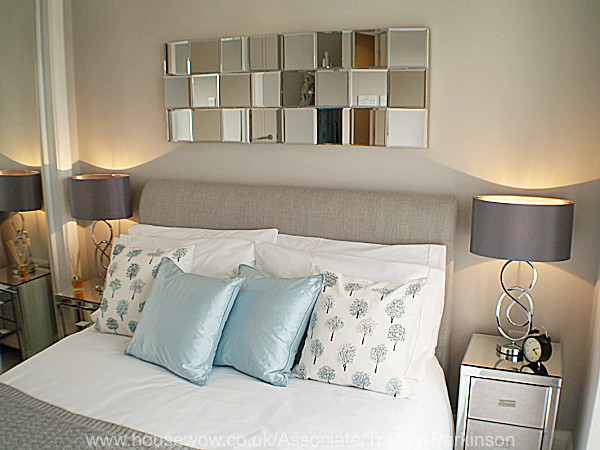 Mirrored furniture and a faceted mirror above the bed were used here to add a bit of sparkle and set off the silver, white and pale blue bedding. 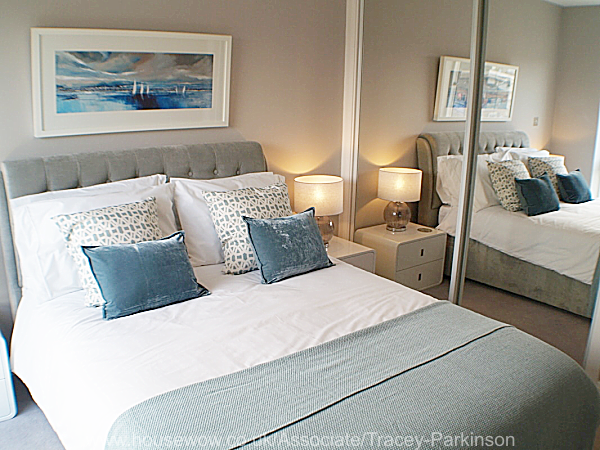 Soft blue tones were chosen here to add colour to the grey scheme, together with contemporary bedsides with shelf storage to fit into the limited space. Blue glass lamps and artwork tie the scheme together. This furniture was also bought with the house. The guest bedroom in a luxury penthouse. 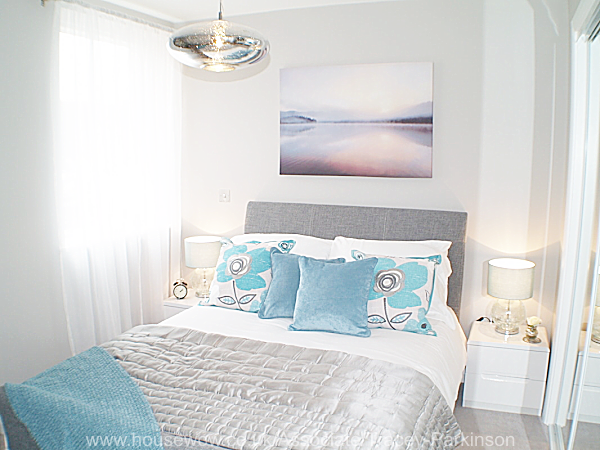 Silver was the main colour chosen for this scheme, but with pops of bright blue in the artwork and cushions. The buyers purchased the furniture with the penthouse. A small master bedroom in a new build apartment. This apartment was bought for use as a holiday let and the purchaser was happy to buy all the furniture too.